A few weeks ago Cate and I made our first trip into mainland China. Like many Hong Kongers, we took a day trip into Shenzhen, the city just across the border from Hong Kong, in search of deals. We took the MTR north about half an hour to Lo Wu, walked through immigration, and there we were. A little hard to read. The buttons are labeled Greatly Satisfied, Satisfied, Checking Line Too Long, and Poor Customer Service. When they’ve finished checking your passport, the lights blink and you are invited to push the appropriate one. The number above tallies the score of that line. I would give anything to find these buttons at O’Hare’s TSA lanes. Harrumph. Shenzhen as a city is a crazy place. It was designated a Special Economic Zone (the first one, actually), which means that it has a more free-market economy than the rest of China and there are special tax incentives provided to foreign investments. And it has boomed. It is huge. It has a huge expatriate community, its population has grown crazily, and all of that. Not being ones to go into such an adventure unprepared, Cate bought a book called “Shop in Shenzhen,” which was exactly what it sounds like. We had maps of the shopping center we were planning on going to, with all of the recommended highlighted and annotated. Yes: we were prepared. 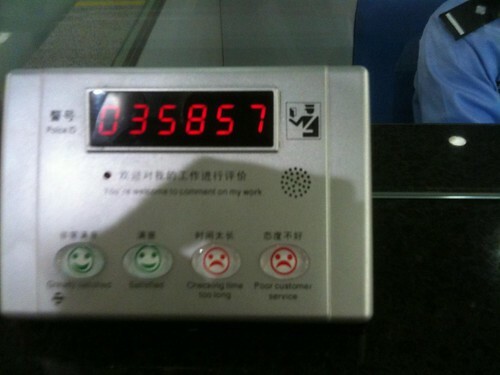 Now here’s how you know you have left HK and entered mainland China: all queuing up immediately ends. After passing through passport control, you have to put all of your bags through an X-ray machine. I felt like I had entered a ca. 1983 scrum to get the last Cabbage Patch Kid—everyone was streaming by, cutting off each other in the rush to throw—I mean literally throw—their bags onto the belt (and on top of other bags too, which didn’t faze the security guards at all), give the Heisman to anyone standing in their way, bolt through the metal detector, grab their bag (shaking off any intervening bags onto the floor as necessary), and head for the door. Good Lord, what is happening? When we emerged outside, we headed straight for the Luohu Commercial City, a shopping center about 100 yards from the immigration exit. 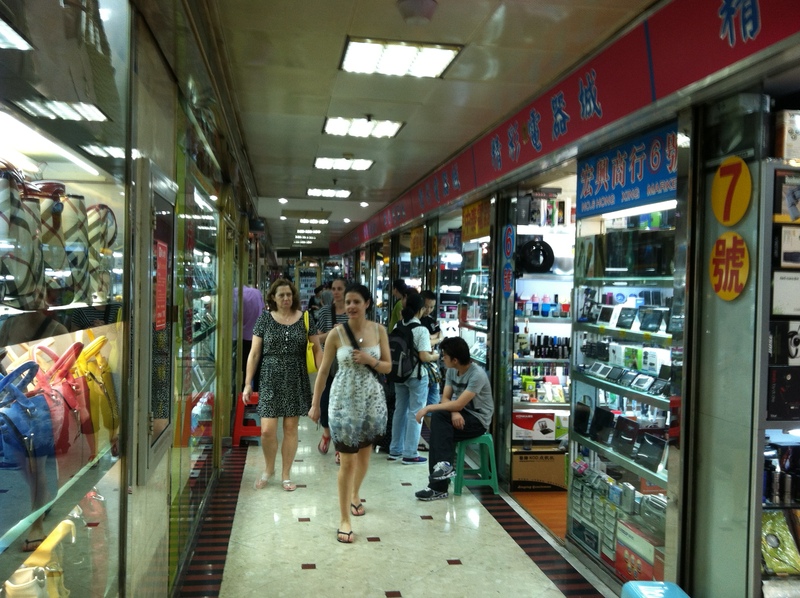 Within seconds, we were besieged by helpful guys eager to help us find where we needed to go, or to sell us some best quality best price copy watches, or handbags, or to take us to the best tailor in Shenzhen. Having been warned about this, we studiously avoided responding at all, and headed for the door of the shopping center where we could be certain of some respite. At first this was overwhelming, but eventually it kind of just faded into the background. Also, by midafternoon energy seemed to have waned, so the invitations were fewer and less urgent. At 10:30 in the morning, though, they were quite aggressive. I can guarantee you that these women are about to be invited by the guy on the green stool to examine his best-quality-best- price wares. “inspirations,” e.g., a bag that looks an awful lot like Longchamp, but has a label that says “Langchamp” and also has slightly different details. There is a considerable ethical gray area here, shall we say. The fakes are not really officially tolerated, which we learned in a very vivid way when Cate walked into a shoe shop and expressed interest in a pair of something-or-others. The shopkeeper (a girl of no more than 17, I would say) appraised us critically, then said “Come with me.” So we followed her down the hall a bit to another shoe store. This doesn’t seem interesting at all, until she walks to the back of the store, looks quickly over her shoulder, and pulls hard on the side of a mirror to reveal a secret room hidden behind. What’s in this room? Behold. That’s a lot of merchandise. The merchandise is a lot less artfully arranged back here in the Secret Space, so you kind of have to root through it like you would at a very nice garage sale. Fortunately, if you express any interest whatsoever in any object—and signs of “expressing interest” include picking up and examining, to be sure, but also gazing at for more than half a second, or even simply standing near; this last being particularly difficult to avoid doing given that the merchandise-to-square-footage ratio is only slightly less dense than that of the back of our family station wagon when I moved to college—someone will appear immediately at your side and name a “best price,” immediately drop that best price just for you and don’t tell her boss (even though she’s clearly the boss), and suggest related items that might be more to your liking and which also, fortunately, are available right now at this moment in this very store, also for a very best price. As someone who doesn’t really like shopping very much, I found this all very exhausting. The haggling, though—and you are expected to haggle, no question—is actually kind of fun. They name price X, you counter with 30% of price X, dramatic protestations are made, offers are exchanged, and eventually (most often) you arrive at a price around 50% of the original “best price.” And that’s, no doubt, not even as low as it could go: a few times we started to walk away from negotiations over items we didn’t really want that badly, and the shopkeeper followed us out of the shop with a new, lower price, a fraction of the original. One additional highlight, however, bears recounting. First of all, you have to know that a lot of the merchandise these shops sell is not actually in the shop, but instead stored in some off-site location. If you asked for a certain size shoe, for example, you’d more often than not be told that they had to call the warehouse, and the size would arrive in five minutes. And typically it did. Some other stores had alternative storage situations. To wit: We were in yet another shoe store (I know, I know), and Cate asked for something in a certain size. One of the shopkeepers said Sure, it’s upstairs, we just need to get it. He accompanied this statement by pointing upwards. Great, we thought. We’ll just hang out for five minutes while they run upstairs. The shopkeeper looked at his colleague and nodded somberly. This second guy—a kid, really—went behind a curtain and came back with one of those small plastic step-stools that you might use to reach something on the top shelf of your pantry. This he put down on the floor, just in front of the curtain, and stepped on top. Then he pushed on the wall with his left hand, the wall gave way slightly to reveal a space behind it, and he leapt up into the ceiling, grabbing the ceiling tile with one hand and scrambling up the door like a parkour wall-run. I stood there, mouth agape. That’s “upstairs”? I did, however, have the presence of mind to get an “after” photo, which shows the slightly open wall-door, our agile friend, and Cate’s new blue shoes. capitalism through the looking glass! I spent part of Sunday catching up and enjoying (vicariously) your droll Rob-told adventures thus far and despite the 14 hour time difference (?) hope you will be able to join us via Skype for our annual Fulbright workshop probably in Feb. & Mar. Have any idea what your schedule may be then? Besides your dogs, what are you missing the most from home? You’ve totally nailed it! Going to that place is overwhelming, but even I occasionally find shoes that fit me! The number on those set of buttons at passport control upon entering mainland is actually the customs officers’ identification, not a tally of ratings. I stand corrected! I had missed the “Police ID” label in the upper left, probably because I was being stared at by a steely-eyed border control officer.